That excitement, combined with her love of nature, eventually led Carrillo to pursue her graduate and PhD degrees in Ecology & Evolutionary Biology at Rice University in Texas. 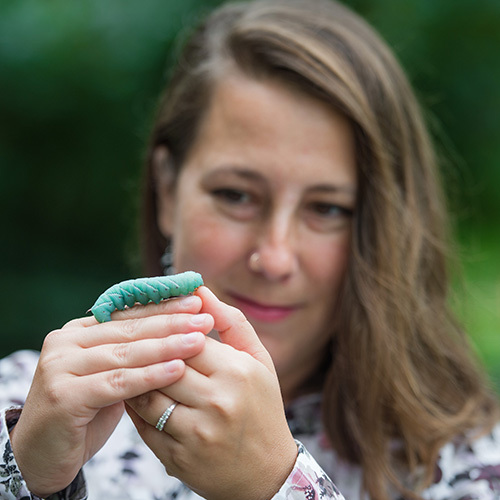 Her postdoctoral research at Purdue University in Indiana focused on how the evolutionary history of plants has changed how plants interact with organisms in the environment, research that she will continue as part of the Centre for Sustainable Food Systems at UBC Farm. Carrillo uses the tomato plant as a case study. Tomatoes send out a chemical signal when they are being attacked by an herbivorous insects, like the tobacco hornworm. Carrillo’s research will help to identify which wild and land race varieties of tomatoes are good at asking for help. Plant breeders can use this information to screen plants for particular traits which can then be bred into domesticated tomato plant to enable them to become more resistant to pests.